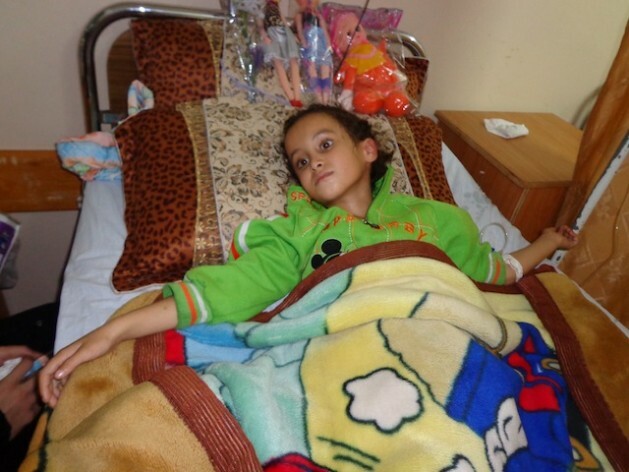 Seven-year-old Nisma Kalajar from Shijaiya in Gaza City has stopped talking after suffering head fractures in a fall from the third floor during an Israeli attack. Credit: Mel Frykberg/IPS. GAZA CITY, Nov 27 2012 (IPS) - As Israel and Hamas separately celebrate the ceasefire and their “victory” over the other following Israel’s blistering eight-day military assault on the Gaza strip, civilians continue to pay the price. According to the Palestine Centre for Human Rights (PCHR) more than 160 Palestinians lost their lives by Nov. 21, the last day of the bloody confrontation between the world’s third most powerful military and Palestinian fighters. The dead included at least 103 civilians, 33 of them children. More than a thousand Palestinians were wounded, including 971 civilians – 274 of them children. Three of the Palestinian civilians killed were journalists who died after repeated Israeli attacks on media buildings where Palestinian and foreign journalists were working. Six Israelis were killed as indiscriminate rocket fire from Gaza targeted Israeli cities. But the war and its consequences have been the hardest for Gaza’s children, unable to comprehend the volatility and the political intricacies in the place they call home. “Mamma, mamma,” cries Muhammad Abu Zour, 7, in the Zeitoun neighbourhood of Gaza city. His head is bandaged and one of his eyes is purple and badly swollen. His eyes flicker upwards and backwards. “There is a possibility that he has severe brain damage as there is internal bleeding within his skull,” nurse Sana Thabat, 23, from Gaza’s Shifa Hospital tells IPS. Muhammad was wounded last week after Israeli F-16 fighter jets targeted his family home as the occupants slept. The shelling killed two women from the Abu Zour family; Sahar Fadi Abu Zour, 20, Nisma Helmi Abu Zour, 21; and Muhammad’s little brother Eyad Abu Zour, 5. The Israeli jets had been targeting the home of an alleged militant next door. The Zeitoun neighbourhood is densely populated by civilians and far from any Hamas military compounds. In another case of Israeli “collateral damage” 11 members of the Dalu family, including four women and four children, were killed when an Israeli missile hit a four-storey house belonging to Jamal Mahmoud Yassin al-Dalu 52, in the north of Gaza city last Sunday. Alia Kalajar, 23, from Shijaiya in Gaza weeps silently as she holds the hand of her seven-year-old daughter Nisma. “Nisma has stopped talking and we don’t know if she will ever talk again. She has a head fracture and is bleeding internally too,” Kalajar tell IPS. The little girl fell from her home on the third floor of a building that was struck by an Israeli drone. Nineteen Palestinian civilians were injured in that strike. Abdel Azis Ashour, 6, from Zeitoun has shrapnel injuries in both his legs. He was playing with his seven brothers and sisters last Tuesday when an Israeli drone targeted his neighbourhood. His cousin was killed and five other civilians were injured. But the little boy remains cheerful despite the grim circumstances and the pain he is in. “I’m not afraid of the Israelis,” he tells IPS as he flashes the V for victory sign. Shifa Hospital staff has been forced to work long hours with limited medical equipment and dwindling supplies of medicines. Maybe Jon Stewart is right, maybe God is the only one who can stop this war … he is, after all, the one who started it. will, or lastly, they are able and willing. then they are not benevolent.